When Ellen Worsdall attended a suburban Chicago wedding last July, familiar faces surrounded her. Everyone at her reception table—and even the bride and groom—were alumni of McCormick’s EXCEL, a program she has led for 14 years. EXCEL is a program that recruits 15-20 incoming McCormick freshmen who have demonstrated a commitment to diversity issues. Worsdall said the program is limited to a small number of participants because it prevents the formation of cliques and encourages group bonding. The program’s purpose is to build a cultural community of support among future leaders. During their five weeks on campus, the students live in dorms with members of the Weinberg College of Arts and Sciences BioEXCEL and ChemEXCEL programs. They attend classes in calculus, chemistry, linear algebra, and leadership. Northwestern upperclassmen, who also participated in EXCEL as rising freshmen, live in the dorms to act as mentors and tutors. 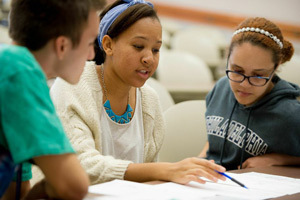 In the leadership course, small student groups are required to identify a problem, design possible solutions, and work with a client to pursue the best answer. For example, one trio designed a password-protected portal to serve as a means of communication between the University and hopeful applicants during Northwestern’s admissions process. The portal keeps track of what materials have been received and notifies the student of upcoming deadlines. Each student group presented final EXCEL Leadership projects on the last day of class in July. After long days and weeks of coursework, the students attend social activities that are mandatory because, according to Worsdall, it helps them learn balance. This summer they toured the Art Institute of Chicago, attended the Taste of Chicago, went bowling, and played laser tag. They also toured NuMat Technologies, a bio-tech start-up that was founded by a group of Northwestern students, including Ben Hernandez, another EXCEL alumnus.